The Butler volleyball team celebrates following a point this season. The team will travel to Chicago to take on DePaul on Oct. 3 before returning home to face Villanova on Oct. 6. The men’s and women’s golf teams kick off a jam-packed week with their lone home tournament of the fall season. This is both team’s second event of the season, with the men coming off the Inverness Invitational at Toledo last week and the women finishing 12th in the Illinois State Invitational in the first week of September. Both teams finished third in last year’s Fall Invitational. Catch the action at the Highland Golf Country Club starting with 36 holes on Monday and the final round wrapping up on Tuesday. The Butler men’s soccer team takes yet another break from Big East play to travel to Southern Indiana to face off against the Evansville Purple Aces. In last year’s match against Evansville, it was Joel Harvey’s first career goal in the 12th minute that was all the Bulldogs needed to pull out a win. Despite Evansville’s one-win season through its first eight matches, the victory was against a ranked Grand Canyon squad who was fresh off wins against Wisconsin and Creighton. 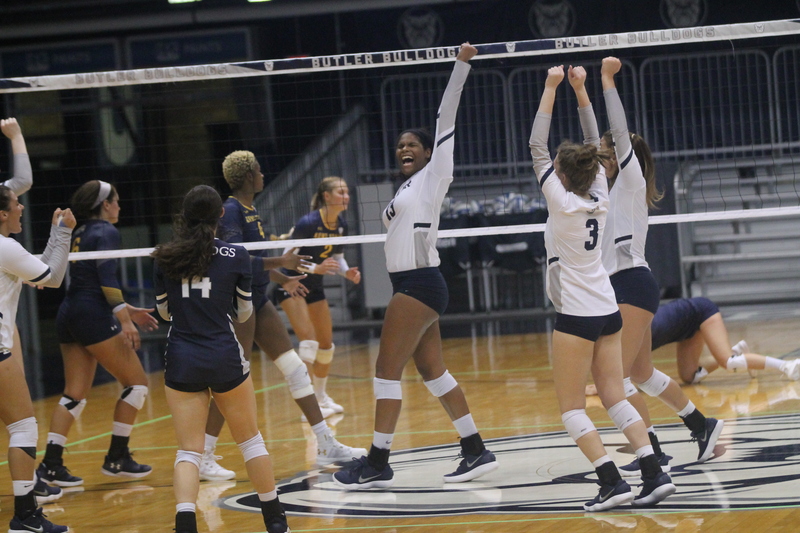 The game is set to begin from McCutchan Stadium in Evansville at 7 p.m.
Fresh off a pair of Homecoming games at Hinkle Fieldhouse, the Butler volleyball team takes a short mid-week road trip for a match with the DePaul Blue Demons. DePaul’s season has been a rocky one so far, to say the least, as they’ve dropped 11 of their first 13 matches. Considering last year’s DePaul team went 2-16 in Big East play, this team doesn’t appear to veer from the trend. Butler won all six sets they played against the Blue Demons last year. First serve from McGrath-Phillips Arena in Chicago is set for 8 p.m.
On Thursday, the women’ soccer team squares off against the Xavier Musketeers. This match is the first head-to-match of the season for any Bulldogs to play their most heated rival. These two played to a scoreless tie at the Sellick Bowl last year. While the Bulldogs have been stellar at home this season, they have split their six road games. This match is set to begin from the XU Soccer Complex in Cincinnati at 7 p.m. The Butler volleyball team opens up their weekend homestand with a match against the Georgetown Hoyas. Through three Big East games so far this season, the Hoyas have already surpassed their win total in conference from last season, where they finished tied for last in the conference with a 2-16 record. One of those wins from a season ago came against the Bulldogs in D.C. As a part of Go. Fight. Cure. Week, this match is set to begin at 6 p.m. on Friday. Let’s hope Georgetown traveled together as the Hoyas’ men’s soccer team will be playing a few hundred yards away from their volleyball counterparts. After securing their first home win of the season last week, the Butler men’s soccer team will look to do the same here against Georgetown, who has experienced a similar falling out of the rankings as the Bulldogs have this year. The two teams look to get their seasons back on track as the match is set to begin at 7 p.m. from the Sellick Bowl. After not having a tournament for a month, the women’s golf team competes in their second invite of the week as they make the trek up to New Haven, Connecticut, to play in the Yale Invitational. Last year’s tournament was composed of mostly northeastern schools, but it was the team from the University of Stirling out of Scotland came out ahead of the rest of the pack. The three-round tournament is set to start on Friday, and the final round is on Sunday. After a week off, the Butler men’s tennis team is back in action this week as they compete in the Purdue Invitational. The Bulldogs were very successful in last year’s event as then-freshman Michael Dickson won the individual championship in his first ever collegiate event against teammate Mason Dragos. Fittingly, Dickson found his way on the Western Michigan All-Tournament team two weeks ago along with Dragos and Aviv Ben Shabat. The invitational starts Friday and goes through Sunday. The Butler football team continues Pioneer League play as they hit the road to take on their canine foe, the Drake Bulldogs. Drake finished second in the Pioneer League a season ago, which included a 27-16 win on the road against Butler. Pace Temple had seven catches for 138 yards in the loss. However, as we’ve seen, this is a new year for Butler football, as they were picked to finish just behind Drake in the preseason PFL Coaches’ Poll. The Butler Bulldogs look to spoil Drake’s homecoming as kickoff from Drake Stadium in Des Moines, Iowa is set for 2 p.m.
Go. Fight. Cure. Week continues on Saturday as the Butler volleyball team wraps up their weekend with a match against the Villanova Wildcats. While Creighton and Marquette have been the mainstays at the top of the conference, it was Villanova who joined Butler as the other two teams to earn a bid in the 2017 Big East Tournament. Last year’s game against the Wildcats was a Friday night, five-set thriller. Be sure to check out this year’s meeting as first serve from Hinkle Fieldhouse is at 6 p.m. The Butler women’s soccer team finalizes our loaded week of Butler sports with a road trip to face the St. John’s Red Storm. Butler’s game last year was seemingly a repeat of the same script as it was Paige Monaghan who once again created the 1-0 advantage for the Bulldogs, and that was all they would need. This year, Butler has to travel to Queens, something a Butler sports team has done each of the last two weeks. The match is set to begin from Belson Stadium at 1 p.m.